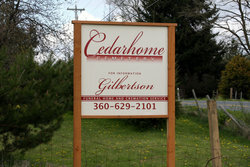 Northeast of Stanwood; managed by Gilbertson Funeral Home, Stanwood. Take I-5 exit 215 and proceed west on 300th St NW 2.5 miles to 67th Ave NW (Monson Corner). Turn south (left) onto 67th Ave NW (Cedarhome Road) and proceed .5 mile to 292nd St NW. Turn west (right) onto 292nd St NW and travel 1 block west to where the road turns right (north). 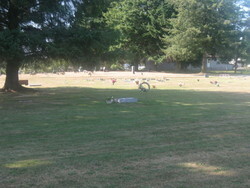 Cemetery is on the far side (west) of the road where it turns.